Lightweight and breathable with a wicking treatment. Raglan sleeves. Flatlock stitched seams. Reflec.. Lavender 55% nylon/40% polyester/5% elastane. Lime punch and sport grey 90% polyester/10% elastane. ..
Quick drying. Loose fit. Self fabric V neck. Centre back seam. Curved hem. Flatlock stitching. Cut o..
Super soft, quick dry breathable high-tech stretch fabric. Carbon brushed for peached softness. Comf.. Smooth moisture wicking fabric. Anti-bacterial. Quick drying. Self fabric collar. Side seams. Twin n..
Quick dry performance fabric. Taped neck. Self fabric collar. Curved back stitch feature. Flatlock ..
Ladies fit. Moisture wicking with quick dry performance. Raglan sleeves with cover stitching. Self f..
Girlie fit. Neoteric™ smooth fabric with inherent wickability and quick drying properties. 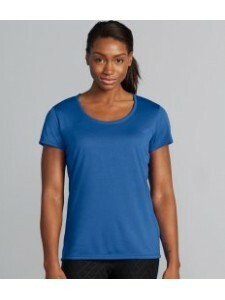 UPF 30+ U..
Textured breathable fabric. Self fabric bound collar. Raglan sleeves. Twin needle sleeves and hem. C..
Quick drying textured fabric. Taped neck. Self fabric bound collar. Cover stitched raglan seams. Twi.. Smooth knit. Moisture wicking with anti-microbial properties. Semi-fitted contoured silhouette with ..
Jersey feel fabric. Moisture wicking with anti-microbial properties. Semi-fitted with side seams. He..
Girlie fit. Neoteric™ textured fabric with inherent wickability. UPF 30+ UV protection. Self fabric ..